Want to be notified of new releases in kd383/GPML_SLD? This repository contains the experiments of the Scalable Log Determinants for Gaussian Process Kernel Learning by Kun Dong, David Eriksson, Hannes Nickisch, David Bindel, Andrew Gordon Wilson. This paper will be appearing at NIPS 2017. Various kernel types, such as square-exponential, Matérn, and spectral mixture. Both Gaussian and non-Gaussian likelihood. The code is built with Matlab. In particular, the Lanczos algorithm with reorthogonalization uses ARPACK which comes with Matlab by default. If you are using Octave and require reorthogonalization, replace lanczos_arpack with lanczos_full in cov/apx.m. Fast Lanczos implementation without reorthogonalization is also available by setting ldB2_maxit = -niter. Please check the comments in demos for example. In this experiment we apply a log-Gaussian Cox model with the RBF kernel and the Poisson likelihood to a point pattern of 703 Hickory tree. The dataset comes from the R package spatstat. To run this experiment you can use the demo_hickory command. This should take about a minute, and produce the figure below. You will see that the Lanczos method produces qualitatively superior prediction than the scaled eigenvalues + Fiedler method. 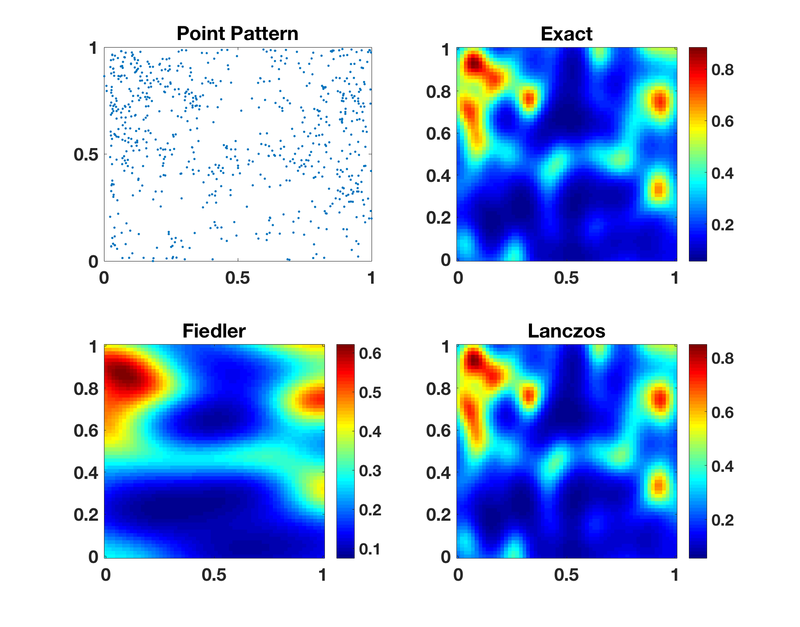 Flexibility is a key advantage of the Lanczos method since it only uses fast MVMs, while scaled eigenvalues method does not directly apply to non-Gaussian likelihoods, hence requires additional approximations. ninterp: Number of interpolative grid points. Default: 3000. Here the accuracy of the prediction is mostly controlled by the number of grid points you use for structured kernel interpolation (SKI). A reasonable range will be between 3000 and 5000. If you run the full experiment setting stored in the data file, you can produce the figure below. As the grid size grows, even the quadratic-scaling cost for scaled eigenvalues method can become prohibitive, but our linear-scaling method remains efficient. In this experiment we work on the dataset of 233088 assault incidents in Chicago from January 1, 2004 to December 31, 2013. We use the first 8 years for training and try to forecast the crime rate during the last 2 years. For the spatial dimensions, we use the log-Gaussian Cox process model, with the Matérn-5/2 kernel, the negative binomial likelihood, and the Laplace approximation for the posterior; for the temporal dimension we use a spectral mixture kernel with 20 components and an extra constant component. method: 'lancz' (default) for Lanczos method and any other input for scaled eigenvalues method. hyp: Initial hyper-parameters for recovery. The demo returns the initial and final hyper-parameters for you to reuse. The initial hyper-parameters was originally obtained through a sampling process, which can be time-consuming and may not be a good starting point sometimes. A reasonable initialization is stored in the data file, but you may enable the function spatiotemporal_spectral_init_poisson to get a new one. This experiment involves daily precipitation data from the year of 2010 collected from around 5500 weather stations in the US. We fit the data using a GP with RBF kernel. This is a huge dataset with 628474 entries, among which 100000 will be used for testing. As a result, the hyper-parameters recovery part of the experiment takes very long. I recommend using the result stored in the data file for inference and prediction, or run the recovery on a nice desktop. The command is demo_precip with a single argument method. The default method is Lanczos, and any input other than 'lancz' uses scaled eigenvalues method.